If you shave your head or are thinking of doing so, then you need the award winning HeadBlade. Its the only razor in the world designed specifically for head shavers. 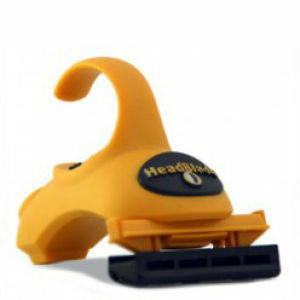 What makes the HeadBlade so special is its ergonomic design. It sits in the palm of the hand, the loop rests just in front of the second knuckle on the middle finger, then the index and forefingers sit on the black rubber pads on either side of the loop. This gives far more control over the blade than a face razor, thereby reducing the chance of cuts and nicks. By keeping the back pad in contact with the scalp the blade finds its own level to enable a smooth glide over the entire head. One blade included.